recovery and reuse of tonnes of plastic and ELTs (up to 35 tonnes) per every kilometre of rail line. The inner core in concrete allows the production of sleepers with correct weight and structural characteristics for various types of rail lines, also the high-speed ones. Greenrail™ is the only sleeper in the world obtained from recycled materials and designed to use a “W” rail fastening system, preassembled in factory. The “W” system allows faster mounting and using standard mechanical systems for the renovation and laying of the tracks. Compared to railway sleepers in reinforced concrete and the composite ones, the technology patented by Greenrail offers numerous advantages regarding the economic and safety aspects, but above all allows an important contribution to the reuse of plastic waste and End of Life Tyres, which is in line with the Green Economy’s circularity. At the same time, Greenrail products respond both to the international regulations and specific local needs, vouching the company as an important player in the dedicated sector. 1670 Greenrail sleepers (equal to 1 km of rail line) contribute to recovery of up to 35 tonnes of End of Life Tyres (ELTs) and plastic from urban waste. The technical characteristics of Greenrail sleepers allow the ordinary maintenance costs reduction by up to 2 – 2,5 times, compared to the traditional sleepers in concrete. The internationalisation begins with personalisation. Greenrail is able to design and produce various kinds of sleepers, following international technical specifications and clients’ particular requests. 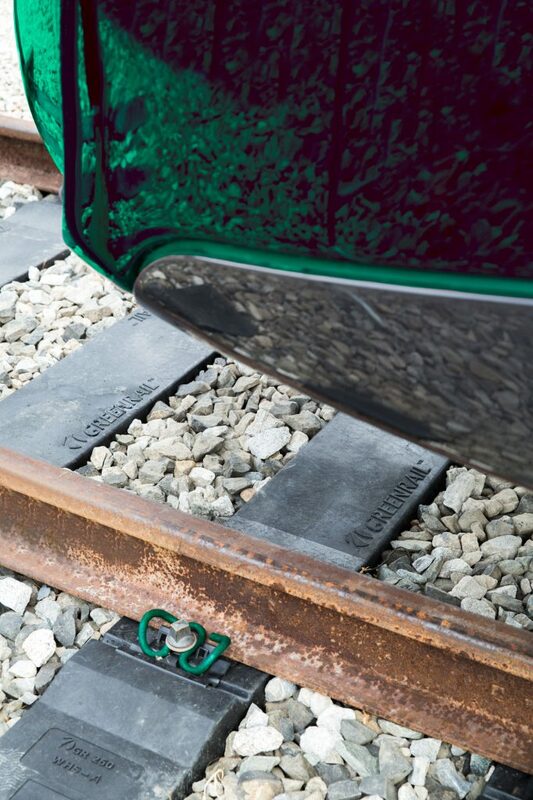 Greenrail sleeper has a longer lifespan compared to the traditional sleepers in concrete. This advantage allows reduction of not only the costs related to the raw materials, but also the energy consumption during the industrial production, with considerable savings throughout the railway sector. Greenrail is the only sleeper able to incorporate different systems and devices, such as photovoltaic panels for solar energy harvesting (Greenrail Solar) and devices for safety and diagnostic data transmission (Greenrail LinkBox). – greater resistance to rails’ lateral displacement.